Around the wider world of golf: Thorbjørn Olesen won the Alfred Dunhill Links Championship on the ET (the pro-am team of Florian Fritsch and Michael Ballack won the team division); Danny Chia won the Mercuries Taiwan Masters on the Asian Tour; and In-Gee Chun won the Japan Women’s Open, the second JLPGA major of the year (bangkokbobby has details). I didn't get to see much of the final round of the Web.com Tour Championship on Sunday. I and some friends were trying to get back to North Carolina from Hilton Head, and the historically heavy storms that hit South Carolina were determined not to let us pass. First I-95 was under 10 feet of water and all the surrounding roads were shut down as well; we were forced to backtrack 20 miles or so to try another route. And while we made it home going that way -- trust me, we are extremely grateful to be home, because this is an unprecedented disaster in our region of the States -- we saw plenty of signs of the devastation, including a car completely submerged except for its roof where it was deserted while still clearly in the middle of an exit ramp! While the battle for Tour cards was hardly as life-threatening as those storms, it was nonetheless a life-changing event for a number of players. Chez Reavie won the Golden Ticket for the Tour playoffs while Patton Kizzire kept his hold on the Golden Ticket for yearlong Web.com Tour play. The guys who came in at the lower end of the card privileges still get the chance to play the Big Tour, even if they aren't fully exempt. And the other guys each have their own tales of fortune or woe. You can see the final rankings for the 50 new card holders at this link. 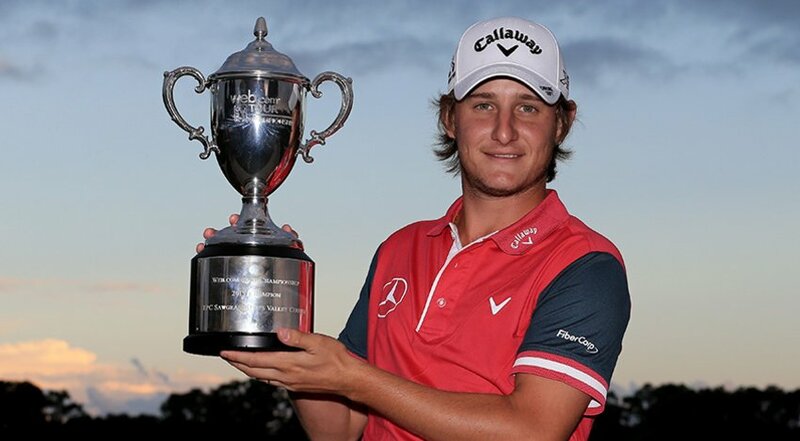 Emiliano Grillo defintely gets one of the better stories. As yet another member of 'Class of 2011' which includes Jordan Spieth and friends, there are a lot of expectations on him. If you've been watching him this year -- and in this tournament, with the pressure on -- you know he'll likely be just as good as his compatriots. What I DID get to see Sunday was nothing different from what Grillo has shown us all year. Tied with Reavie on the 18th hole, all he did was drain a 20-footer for birdie, forcing Reavie to do the same if he wanted a playoff. Reavie couldn't do it, and Grillo walked off with the title. Just like Spieth and the other early-20-somethings, he has that 'something' that tells fans he means business... and that he can finish that business as well. I won't be surprised to see him build a huge following on Tour. And since he holds the fourth card, I suspect he'll have plenty of chances for those potential followers to see him. He just might -- if you'll forgive the pun -- take the Tour by storm. He’s bound for the Big Tour next season. Grillo might have for fan-pleasin’. The photo came from this wrap-up page at PGATOUR.com.